Atul Gaikwad, a coach in Pune, was disturbed by the fact that one of his wards, a promising left-arm spinner on the local circuit, was identified as having a dodgy action. When the bowler's action was exposed during the second edition of the Maharashtra Premier League in 2010, which was televised, the young bowler was not only barred from bowling but also was heckled as a "chucker" frequently. He sank into depression and even attempted suicide. "While the kid suffered, I thought that being his coach, the fault was on me to not have been able to identify and rectify his suspect action, so I took it upon myself to not let the same mistake happen again," Gaikwad says. The incident sparked off his research into the problem of illegal actions, which then evolved into a thesis. Gaikwad recently became possibly the first person in the country to be awarded a doctorate for his extensive work on the topic. While the cricket fraternity is scratching its head over how to get rid of chucking in international cricket, Gaikwad's thesis, "Study of Illegal Bowling Action in Cricket: Causes and Remedial Programme", revolves around the need for early detection and corrective measures. It concludes that the sooner a dubious action is detected and worked on, the better it is for the bowler's prospects of being able to continue bowling legally in the long run. Gaikwad also concludes that coaches and umpires at the grass-roots level need to be educated in order to prevent the menace of illegal actions spreading. "Most of the coaches and umpires are either uneducated or ill-educated about the basics of what constitutes an illegal action," he says. "As a result, most of them either don't recognise a suspect action or ignore it, which results in the bowler getting used to bowling with the same action without realising that there is a problem." Gaikwad based his findings on a comprehensive study of Under-14 bowlers in Maharashtra. In 2011, he examined 106 bowlers from 12 prominent academies in Pune, who were competing in the Maharashtra Cricket Association's selection trials and found 37 of them had dodgy actions. Those 37 bowlers were then divided into two groups -19 of them went through monitoring with corrective measures, while the remaining 18 were only monitored. After six months, when all 37 were tested again, 17 of the 19 who were undergoing rehab were found to be bowling with legitimate actions, while the 18 who didn't get technical support continued to bowl with flawed actions. "This sample study proved that if you have the basic facilities of video analysis and decent technical know-how as a coach, you can convert an illegal action into a legal one at an early stage in a bowler's career," Gaikwad says. What leads to illegal actions? Gaikwad's study recommends that coaches and umpires at the local level need to be educated and made accountable. "Strict vigilance in youth cricket, strict action by umpires and officials on chucking, and accountability from them, including coaches, is crucial," he says. Gaikwad stresses the need for helping budding cricketers with the basic techniques of video analysis. "If a coach has spotted a player with a suspect action, if he shows the video to the player, in most cases, the player realises what is wrong with his action. Then it is up to the basic corrective measures, which work for most teenaged cricketers." The thesis also suggests the basic corrective measures. According to the study, the early turnover of the bowling arm, upward palm position of the bowling arm when horizontal level, and inappropriate follow-throughs lead to bowlers developing illegal actions. "By changing palm position of bowling arm from upward to sideways and downward position, chuckers were converted into legal action," Gaikwad notes. Most bowlers struggling with illegal actions - especially in the subcontinent - are spinners. Gaikwad's study has attributed the phenomenon to "role-modelling or imitating elite bowlers having history of dubious action". "This is where a coach's role comes in. There is nothing wrong in a ten- or 11-year-old trying to bowl like one of the top bowlers by watching him on TV without knowing that his action is suspect," Gaikwad says. "It is the coach who has to stop him from copying a dubious bowler and teach him to develop his unique style instead." Gaikwad belongs to the rare breed of a successful coach in India who has not played first-class cricket. After being certified as a Level-III coach in the National Cricket Academy's top-rung examinations, he has been in-charge of various state and zonal women's teams, and has been assisting at the BCCI specialist academies over the last six years. In 2013 he got himself a Level III certification from Cricket Australia. And he has been running a coaching academy in Pune for almost two decades. Over the years, Gaikwad observed that the emphasis on making children bowl with a leather ball on a 22-yard wicket results in young bowlers developing a flex in their action. And his research for his thesis confirmed his observations. "In all of the western countries, kids are made to first bowl with a tennis ball, then a semi-hard ball, and then a leather ball, so that their body can get used to the weight of the ball. And most of the Under-12 and Under-14 matches are played on 18-yard wickets over there, which should also be implemented in India." Gaikwad also notes that chucking is rampant, and frequently overlooked, in women's cricket. "Some of the coaches tell me it's okay, since these are girls. But how can we ignore it? A clean action is a clean action. Doesn't matter if it's a boy or a girl bowling." One of the key recommendations in his thesis is to establish "support centres" for coaches and umpires to detect illegal actions and suggest remedial measures. For this, Gaikwad has been in touch with Ratnakar Shetty, (the BCCI's general manager - game development), and MV Sridhar (general manager - cricket operations), both of whom "have been very supportive and positive". It hasn't all been smooth sailing, though. Gaikwad sent his findings to some of the top bowling coaches hired by the BCCI, to get feedback. "And many of them unfortunately didn't give any suggestions about the content but pointed out grammatical errors. Since the thesis has been translated into English from Marathi, some errors are bound to creep in." Gaikwad's work could well prove to be handy for further research in India, since hardly any research material based on Indian conditions and bowlers is available. 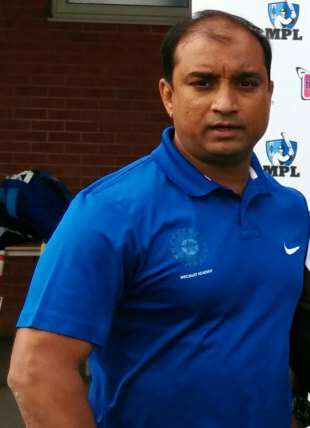 For his research, Gaikwad referred to papers by various sports scientists in England and Australia. He hopes that his work will be useful for coaches and researchers in future.